Submitted by Taps Coogan on the 3rd of February 2019 to The Sounding Line. The following chart, from the cost estimation website HowMuch.net, helps visualize a reality that has plagued most Americans for the past couple of decades: real price inflation is much worse than the headline CPI numbers suggest. Based on CPI data and hourly earnings, the following chart shows the change in affordability of a range of common goods and services since 1998. Official statistics suggest that the rate of inflation has averaged a subdued 2.15% since 1998. In reality, the average inflation rate masks dramatic cost increases in the purchases Americans have the least discretion over. Imported consumer goods such as TVs, computers, toys, and phones have gotten significantly more affordable and more feature rich, largely thanks to the offshoring of American manufacturing to wherever labor is cheaper. To a lesser extent the same phenomenon has kept cars, furniture, and clothing costs roughly constant. Meanwhile, the price of anything that can’t be imported from places like China has skyrocketed. Food, housing, medical care, child care, college tuition and textbooks, and hospital stays have all increased more than the core CPI inflation averages. Meanwhile, quality has remained flat at best. In other words, official inflation statistics don’t look bad because they are using cheap consumer goods like toys and TVs to offset large price increases in more expensive and harder to do without things like housing, food, medicine, and education. With the US now placing tariffs on many of the cheap imports that have kept the CPI numbers so low, one has to wonder how much longer the official headline inflation numbers, and the Federal Reserve, will be able to ignore the true rate of inflation. i suggest the first assumption should be: the real inflation equals hourly earnings rise. simple reason: they would not pay you more unless they are on one hand forced to by the inflation on the other hand they are sure all they pay you is already eaten by the inflation. more reason: inflation is an AGGREGATE. it is difficult to WEIGH all your expenses, but your income is usually single-source and its weight is 1. Interesting points but if real inflation was just hourly earnings, people would never lose or gain real purchasing power. AT LAST,someone who tells it as it is.I’ve known for years that we have been lied to regarding real inflation rates !Just compare this years essential purchases to last years and it stands out like a sore thumb.I saw one report in the past that actually had the audacity to include a reduction in the price of CAVIAR ! !Something we all buy on a day to day basis !All the time the purchasing power of our take home pay goes down & down but the truth is kept from us ! EDIT: I only realized after posting my comment that I had misread the graph to start in 1991, instead of 1998. 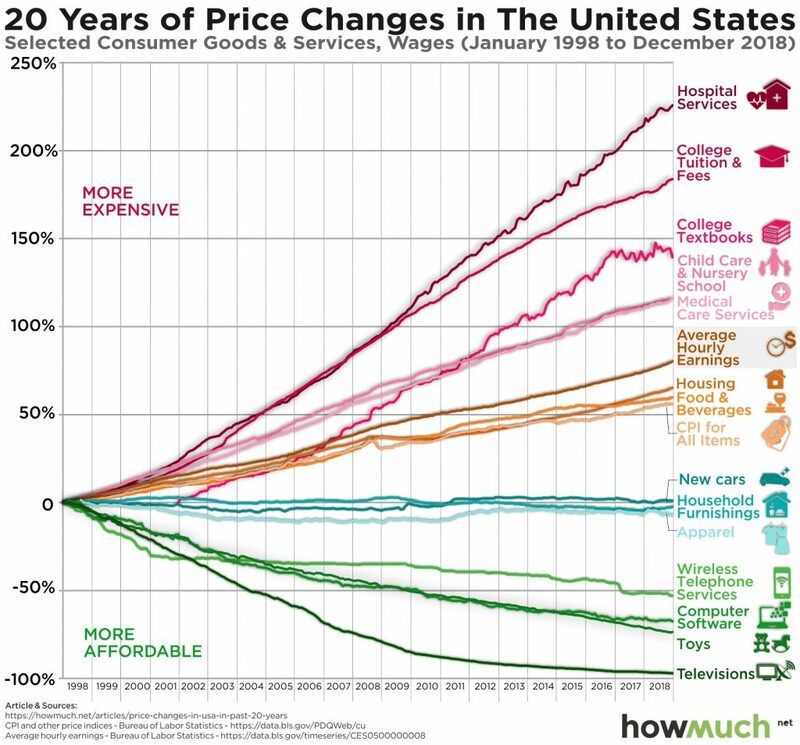 But my basic argument, that even the above graph woefully underreports the TRUE rate of price increases in the US over the past 20+ years, still stands.